Broadly speaking, the 2013 growing season in Vacqueyras mirrored conditions in neighboring Gigondas, which meant a cold start to the growing season, with a meager flowering not occurring until the middle of June. The fruit ripened very slowly through a cool and mostly dry summer, leading to an extremely late harvest featuring much less fruit than normal. Picking occurred in cool weather and thus the harvest proceeded at a leisurely pace, with ample time for picking carefully—and for eliminating sub-par fruit when it arrived at the winery. While that was bad news for quantity, it turned out to be good news for quality, as the grapes - assuming they were allowed to hang on the vine long enough - could be picked at optimal ripeness and with healthy natural acidity. One interesting factor in the 2013 equation in Vacqueyras is that all varieties achieved ripeness at almost the same time. Thus many estates were able to carry out their harvests in a long, continuous sweep—as opposed to the normal start-stop-start process required when the early-maturing Grenache is picked well before the other varieties ripen. Given the fact that producers in Vacqueyras typically rely more heavily on the “darker” Syrah and Mourvèdre varieties than their colleagues down the road in Châteauneuf-du-Pape, the 2013s here are more classic in the context of their appellation. They are more savory and less fruit-driven than most Châteauneufs, with higher acidity and somewhat firmer structure. 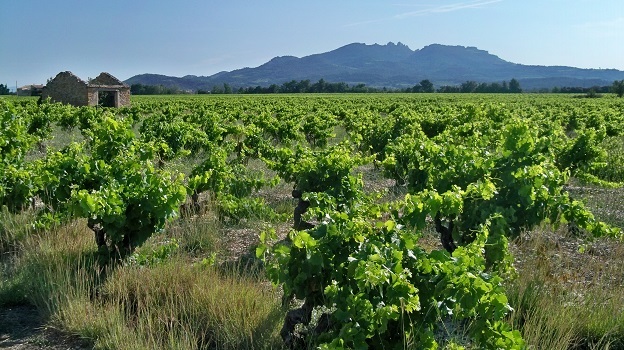 The vineyards in Vacqueyras are planted at relatively high altitude, and sugar levels in the grapes rarely reach the heady levels of Châteauneuf or even most Gigondas. The wines of Vacqueyras are usually a bit more rigid than those of their neighbors, and that’s especially the case in a cool year like ‘13. That said, since the fruit here doesn’t usually experience the skin-toughening effect of baking sun, the tannins in Vacqueyras, while definitely present, are seldom forbidding. The wines rarely require extended cellaring for those tannins to soften and integrate. While a top-notch Vacqueyras will definitely reward patience, it usually does not have to be stashed away for a decade before showing its best. As for the 2012s, which are now steadily flowing into the market, I find the majority of the wines quite perfumed and fruit-forward, with easygoing tannins that will allow them to be enjoyed soon after release. It was a dry vintage, with about 25% less rainfall than normal, but the preceding winter was exceptionally rainy, so clay-rich sites in particular had good water reserves to see them through the dry growing season. The bad news, though, is that a bitterly cold and dry winter (especially the month of February) that followed the rainy late fall caused significant damage to the vines, with some vineyards realizing up to a 50% crop loss. But the summer was then hot and dry, which kept vine diseases at bay and allowed healthy, ripe fruit to be picked starting around the third week of September. Some locals compare 2012 to 2007 but I don’t see that, as alcohol levels are almost universally lower in ’12 and the fruit profile leans toward reds rather than black. If I had to compare 2012 to another recent vintage, I’d probably say 2009, another year that gave approachable, fruity wines that were wonderfully tasty from the get-go—and that are still drinking great, by the way.